What is Digital Data Destruction? Digital Data Destruction is the Destruction of Data that is stored on electronic devices in the form of tapes, hard-drives, CD’s, USB Keys and Microfilm to name a few. The destruction of the stored information is completed in order to make it unreadable, inaccessible and in turn cannot be used again. When deleting files on your electronic device such as a PC, it will no longer be readily available to access by your operating system however the data is still present on the memory device. This data can be accessed through the use of “Data Recovery” techniques that can enable an individual to recover data that is lost, damaged, formatted, corrupted or inaccessible. Another method of deleting/corrupting data on media devices is a method called degaussing. Degaussing is a machine that will change the magnetic field in magnetic storage devices. However, this method also holds risks as you need to be certain that the appropriate magnetic field is being applied to a specific drive to know that the info has been corrupted. In addition to that there is no way of telling if a hard-drive has been successfully “degaussed” by looking at it. The only way you can know is if you try and use the hard-drive again and the data is still there, which in todays Data Protection World is too late! The most trusted, secure and effective method for destroying digital data is to destroy the device that contains the actual data. This is achieved through shredding the device and breaking it down to it’s base materials. The base materials are then segregated and recycled achieving total destruction of the data, peace of mind for the individual and full compliance with legislation. Why use our Data Destruction Service? At Security in Shredding, our No 1 objective and sole purpose is to securely destroy (permanent destruction of) personal and commercial data. Our Digital Data Destruction Service is no different. We fully destroy the devices which contain the stored information and use a zero-landfill destruction process. Physical destruction is the only method to ensure that all of the data on an electronic device is 100% destroyed and in compliance with legislation. Our hard-drive shredding service includes our unique chain of custody protocols which in turn ensures safe, secure and compliant destruction of your media. Our client’s media is never left unattended throughout our destruction process. Our National Standard security screened staff are specially trained in the destruction of digital data. We destroy client’s hard drives In line with EN 15713 shred sizes. 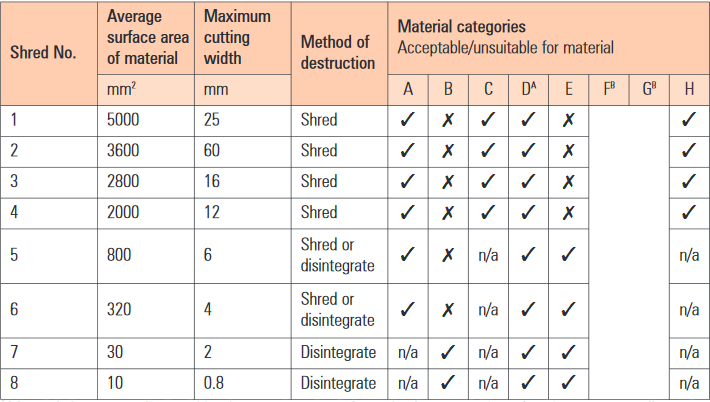 Clients can receive a 17-mm fragment shred size or opt for our unique particle shred size where the hard-drives are shredded down to small fragments conforming to shred No.6 of EN 15713 (Please see table below). Once the hard-drives are destroyed the client is issued compliance certification with the number of hard-drive units listed. If a client requires, we facilitate asset tracked certification. Asset tracked certification is where the serial number from each hard-drive is recorded and included on the compliance certification to prove destruction and regulatory compliance. In addition to the asset tracking we can also facilitate video evidence of the media destruction process. At Security in Shredding we strive for excellence and invocation. With this ethos, we are the only Irish shredding company to have introduced a specialist mobile hard-drive shredding truck for Irish businesses and individuals. Our unique technology has been specially designed for our business and our clients Data Protection requirements. The hydraulically powered, direct PTO driven shredding technology has the fastest through output available to clients in Ireland. Not only the best through output, our shredding technology will destroy hard-drives to a 17-mm particle and maintain the highest through output performance. Industry average shredders will achieve a 20-mm particle and one third the through output. The technology is capable of achieving both a 17-mm and a 4-mm shred size. To maintain the highest level of security, our vehicles are GPS monitored, immobilised and have constant communication with our head office. Our hard-drive shredder is also fitted with a specialist CCTV system which will monitor the whole destruction process. Unit hard-drive recording can also be facilitated for clients and provided with compliance certification to keep on file in order to illustrate compliance and industry best practice. For all your destruction needs, contact Security in Shredding and protect your business.